If you’ve ever seen an old movie where the beautiful debutant makes her way down a spiral staircase into a grand ballroom, then you may have the impression that spiral staircases are expensive and only suitable for Hollywood mansions. But if you love the graceful look of the spiral staircase, you’ll be happy to know that there is a beautiful and affordable option in modular spiral staircases. 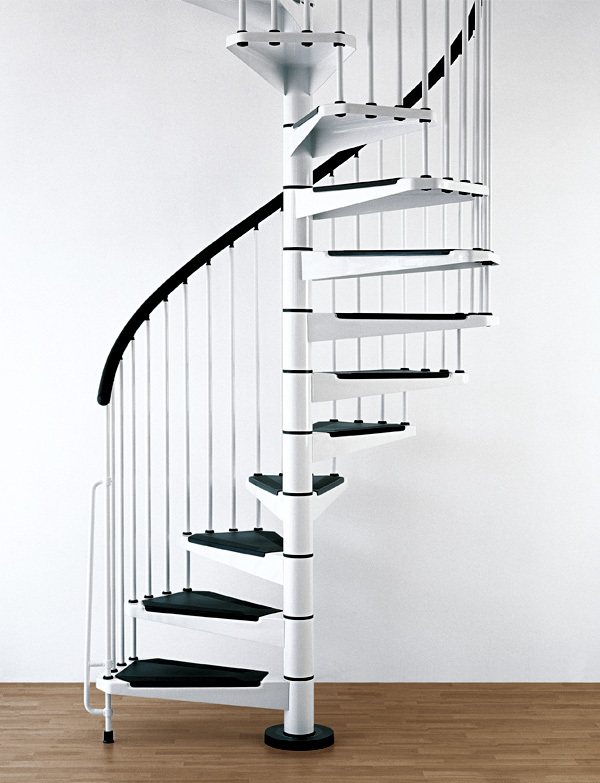 What is a modular spiral staircase? Simply put, it is a helix shaped staircase kit that you can order to have installed in your home either by a professional or yourself if you have some DIY talent. Using our online measuring tools, or by calling us for a consultation, you can determine the exact measurements that you will need as well as choose from a variety of options for customization. Components for our staircases are in stock, so turnaround time from order to delivery is quick – no more than three weeks in most cases. In no time, you will be enjoying sturdy, beautiful and quality spiral stairs. Homeowners choose modular spiral stairs for many reasons. Whether it’s the convenience of being able to order them directly, the ease of installation or simply because people love the way these stairs look, the popularity of these stairs is increasing. Unlike traditional stairs which can take up a lot of room in your home or apartment, spiral staircases are very compact. For example, say you are connecting two floors with a set of stairs. With conventional stairs, you’d require about eleven feet of length. Once you factor in the incline and the standard sized steps, the space consumed can be 22 square feet. Spiral stairs on the other hand, can be installed in a much tinier area as they only take up about four square feet of floor space. This makes these staircases ideal, both for small spaces or any area where you’d rather take up less space with your stairs and have more space for living. Another advantage that a modular staircase has over a traditional one is its cost effectiveness. Unlike most traditional stairs, the pieces do not have to be measured and cut onsite. This can result in a savings of both time and money. And because they are easy to install, a professional should be able to put them in quite quickly for you. Alternatively for DIY, homeowners – installing these stairs can be a simple weekend project. A spiral staircase is a functional work of art. Remember those sweeping staircases from the old movies? Well, you may not be going for anything quite that grand but spiral kits are still pretty eye-catching. And don’t forget, that even with a kit, there are a variety of options for customization that can help you to make your staircase your own. Options from materials such as wood, steel and cast iron to design options are available. To select the modular staircase that is right for you, use our online tools and select from a variety of tread styles and coverings, handrails, spindles and accessories. Or call us today for a consultation.